D.C. Eagle Cam Captures Second Eaglet Emerging : The Two-Way "Mr. President" and "The First Lady," a pair of mated bald eagles in the National Arboretum, are officially raising two eaglets: their second egg hatched overnight. Mr. President, The First Lady, DC2 and DC3 at feeding time Sunday morning. Very early in the morning on Sunday, a D.C. resident made a hotly anticipated appearance — one that only a few lucky people managed to watch in real time. A second baby bald eagle hatched in a nest in the National Arboretum around 3 a.m. EDT. 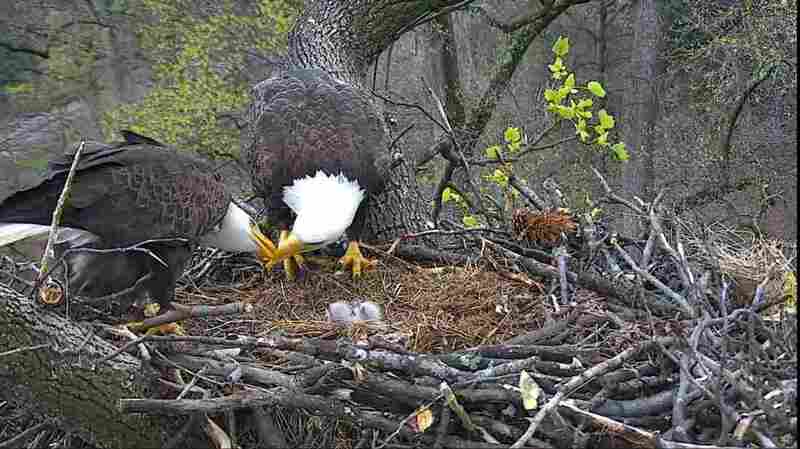 The nest of "Mr. President" and "The First Lady" is hooked up to a webcam and has captivated more than a million people, according to the American Eagle Foundation's webmaster. "After days of anticipation, a fuzzy wing flopped out of the remains of an eggshell Friday morning. ... The bird then worked its way out of its shell over the next hour, emerging more fully around 8:20 a.m. ET. "Throughout the process, its parent eagle alternated between peering attentively (to be honest, eagles don't seem capable of anything but) and nestling over the fledgling and a second, as-yet-unhatched, egg." DC2, the first eaglet to hatch, is in the foreground; the younger sibling is in the back, still working out the mechanics of sitting up. But the younger sibling debuted during the wee hours. The feed was still running — it uses infrared light at night, which is detectable by the camera but not visible to the birds — and a few fans managed to witness it. The younger eaglet takes a tumble as the two birds sit in the nest, watched over by a parent. For those who missed it, the first sign of the news was a freshly broken eggshell at the edge of the nest — then a second ball of feathers visible at feeding time. The older eaglet is, for now, named DC2 (as it is the second eaglet raised by Mr. President and The First Lady at this location); the new arrival is DC3. Fans, of course, have suggested a wide range of alternate names — from Sasha and Malia to Merry and Pippin. 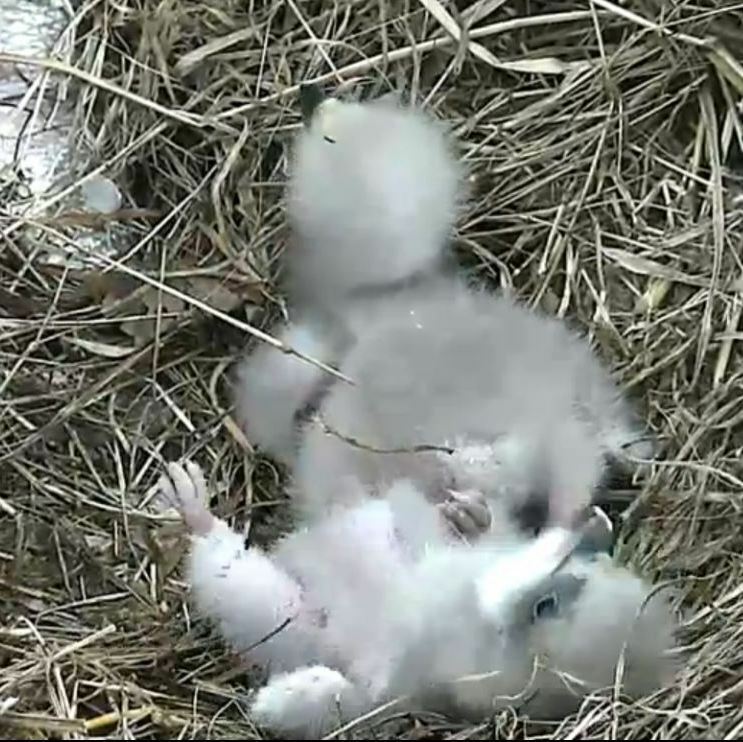 Whatever you call them, you can watch the eaglets at the webcam. 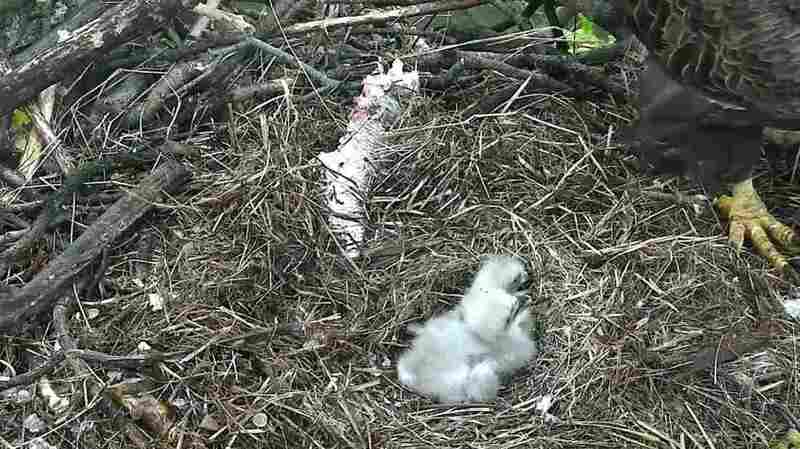 Again, we'll remind you that, as the American Eagle Foundation says, "This is a wild eagle nest and anything can happen."